Callicore hydaspes (Nymphalidae), one of the common small Nymphalids in this area of the tropics. common in north Argentina and neighboring countries. this specie is flying near the ground drinking from moist rich soil and other wet sufaces. its inner wings are much more beautifull with shining colors but unfortunately it rests and feeds with its wings folded. guess it is a bit shy... but smart. here in the shade it can escape the 40C temperature outside although moisture remains almost 100%. not very pleasent for the laying muddy poor photographer next to it. Beautiful shot.. Great details. Love the colours too. A beautiful butterfly and a beautiful photograph of it, well done! A very beautiful macro, Oz. The colors of this butterfly are stunning, the detail great and the POV - superb. excellent picture of this beauty. The flash just high-lights the peculiarities of the wing colours which are partially iridescent. A fine shot of this colourful butterfly. Excellent detail and a great POV. phantastic shot, this butterfly is so special and the eye is like a big glittering star. Excellent colors, clearness and a beautiful butterfly! Good detail, colours and sharpness. exposure and lighting are good. Good POV and composition. Thanks for posting, enjoy the rest of the weekend. Superb dark blue bg! So beautiful species! Big diamond eyes! Great moment also! Sharpness, pov, framing, colours, details all are great again! I'm waiting to your pictures. Very good picture of this butterfly. Great color, position, details and BG! where on earth do you get like this man ? so beautiful and colorful. do you see a very nicely designed eye here? great picture. Wonderful close up.POV,sharpness,details,OF,colors,BG,framing and composition are excellent. A perfect done picture in a dark key. Excellent colours, impressive BG, masterful selected DOF and great details. Bravo. TFS. 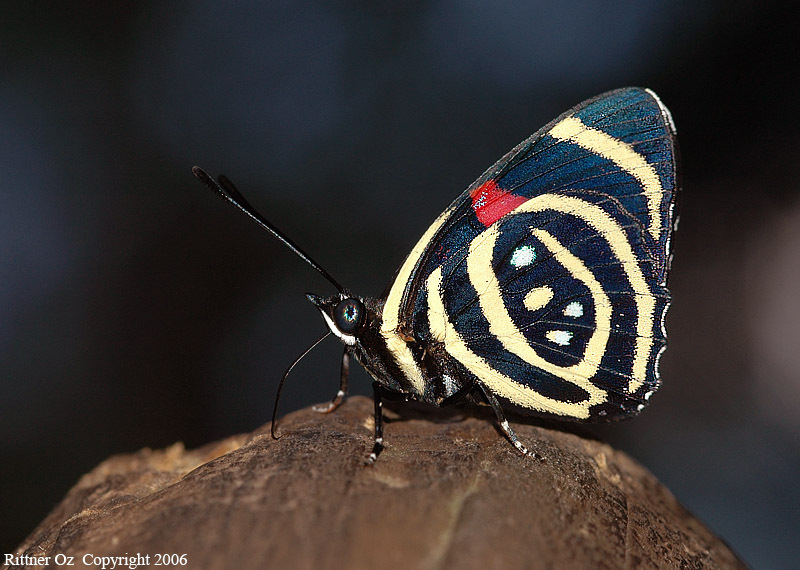 It is an amazing butterfly. It has different eyes color. Well done! Never seen anything like it before. Nice work. I have never seen such a wierd yet so beautiful one. You have achieved a great composition with flawless sharpness and colors.